So, recently I talked a little about the big pharmacy chains in Japan. But if you're like me, even after you find and walk inside a Japanese pharmacy, you have a bit of difficulty identifying and choosing what you want to buy. Part of this is simple brand unfamiliarity, and part of it is the language barrier--and I'm sorry to say that in my experience, it doesn't get much better with time. Even after I learned Japanese to a tolerable degree, I found that it is a skill of conscious effort. It is still very easy for me to just "tune out" Japanese characters when I'm presented with advertisements, billboards, and product packaging. If I want to know what they say, I have to stop and think about it. This may be purely my take on the product, but Eve's brand name, tiny tablet size, designer packaging options, soft-toned TV commercials predominantly featuring female celebrity endorsements leads me to believe that this product might have a gender bias in its marketing patterns and sales figures. (Hell, even one of the main tabs on its website links to a page of tips for "How to reduce/relieve menstrual cramps.") But inside the box, Eve is just garden-variety ibuprofen, good for reducing swelling, fever, and sensations of pain. The dosage size is somewhat small by western standards (I think a regular adult dosage is two tablets, but always check the packaging); if I take that dose and give it a little time to kick in, it tends to work for me for minor headaches. A few of my expat friends use slightly adjusted doses for their particular weights and levels of pain (or pain tolerance). I did not notice myself getting really sleepy after using Eve--I've taken it at work for headaches--but because of the inclusion of a sedative, driving and operating machinery is not advised after taking it. You probably noticed the weird [Type A] indications after both product names thus far. It's popular for Japanese pharmaceutical companies to keep medications used for the same purpose under the same brand umbrella in order to strengthen the brand's general recognition. Therefore, when the same company puts out two different compounds both meant to treat, say, headaches, they'll use the same brand name for both compounds and instead distinguish the two products with an addendum after the name. 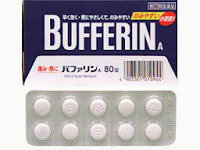 So, drugstores end up packed with products like Bufferin A, Bufferin EX, Bufferin Plus S, Bufferin Luna, and Bufferin Luna J. Anyway, the point is: Check the label of any OTC product you consider buying. 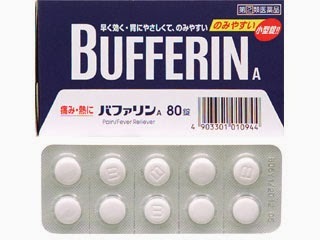 Just because it carries the brand name Bufferin doesn't mean it's going to be an exclusively or primarily acetylsalicylic acid product. Eve Quick, for example, contains a sizable dose of magnesium oxide (analgesic, antacid) as well as the ibuprofen present in original Eve A.
Loxoprofen is a pet development of Daiichi Sankyo, who has secured the rights for the compound (or their process of compounding it, anyway), and markets it in Brazil, Argentina, Mexico, and India, as well as Japan. This is very useful for me! :D Will you be doing one on cold medicines? I had planned and started to write one on cold medicines. :) I'd like to add it to the site in the future, yes. Thank you for this post! 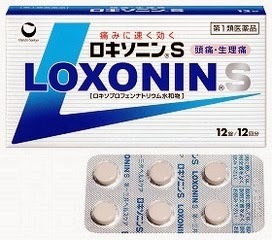 I'm in Japan now and crying with horriffic cramps that won't go away and all we have is loxonin that my fiancé got prescribed after a leg injury and I'm really sceptical to taking other people's prescribed meds but after reading this, I took two and I hope I will finally be able to sleep tonight. After walking approx 11 miles one day in Kyoto, my legs were aching and I needed ibuprofen! I went into a pharmacy and had five very nice employees surrounding me trying to help. After a few minutes, on their recommendation, I'd purchased a small package of Eve Quick. I made my way to the train and sat down and Googled it. The first thing that came up was "for menstrual cramps". We got a laugh out of that, and, later, when my wife asked if my legs felt better I said, "no, but my cramps are gone."